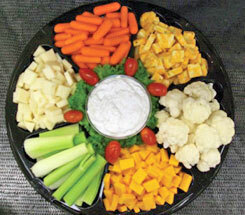 WESSELMAN’S DELI & PRODUCE DEPARTMENTS PREPARE FRESH TRAYS & PARTY PLATTERS TO FIT EVERY OCCASION! Let us help with all your parties! Whether you’re picking up lunch, dinner, or planning a party, our Deli Department offers a wide selection of meats and cheese. Need a tray for a party or special event? We’ve got you covered. Just call and let us know. We can handle your needs with 24 hours notice. 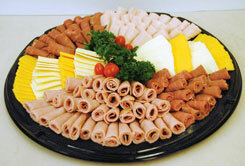 Our most popular party tray includes lean baked ham, cooked roast beef and tasty turkey breast accompanied with American, Swiss and Colby-Jack cheeses. Garnished with cherry tomatoes. 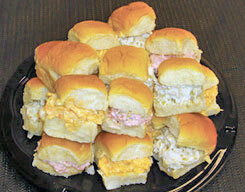 King’s Hawaiian Rolls sliced and prepared with an assortment of spreads including all white meat chicken salad, ham salad and pimento cheese spread. Cauliflower, celery and carrots with cubes of Colby, Pepper Jack and Swiss Cheese. Served with Ranch dip. Garden fresh vegetables are perfect for snacks, lunch, or dinner. 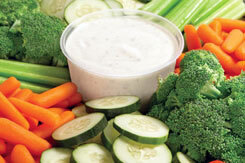 Fresh baby carrots, celery sticks, broccoli, ripe olives, cherry tomatoes, radishes, cauliflower, pickles and more, are centered around a Ranch or French Onion dip. 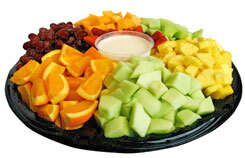 This delicious fruit platter is hand made in store with fresh seasonal fruits. Served with a slightly sweet, cream cheese dip on the side. Give Us a Call to Order!